Alexis Batausa organizes monthly 5K walk/runs for the Diabetes Coalition and Tug Valley Road Runners. “We’re making it easy for people to develop a habit,” he said. He also sparks a Thursday night runners group and keeps up a facebook page where he announces daily runs and keeps up encouraging chatter. 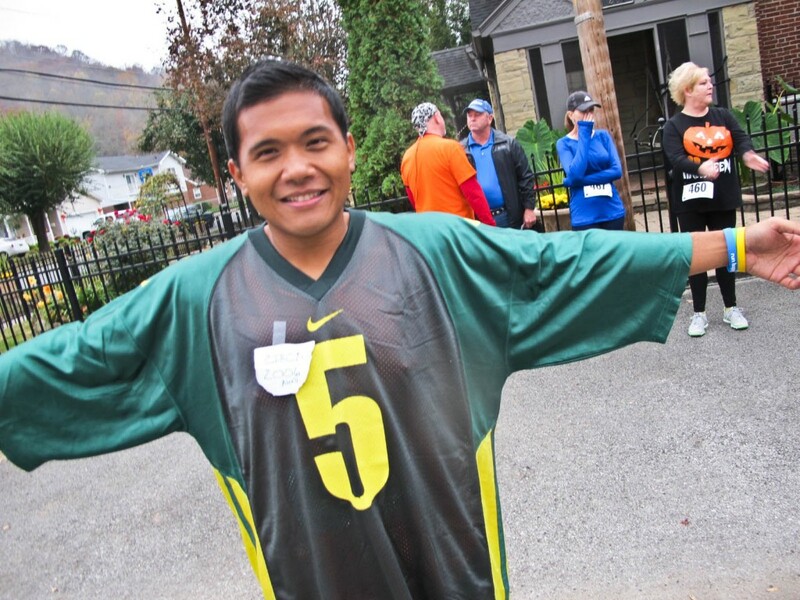 He’s wearing a jersey he bought before he lost more than a hundred pounds through running. “He’s a living advertisement,” said diabetes coalition director Jenny Hudson. 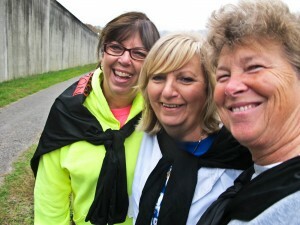 These three retired schoolteachers started walking together as part of the Diabetes Coalition’s “Walk to LA” lunchtime challenge walk in 2011. After it was over, “we just kept walking,” including monthly 5Ks, said Dry Simpkins. The Tug Valley Road Runners Club used to hold two or three well-publicized races a year. They attracted out-of-town runners and raised money. “But not many local people ran, and it didn’t do much to encourage local people to run year-round,” said Vicki Lynn Hatfield, founder of the Mingo County Diabetes Coalition. Then in 2010, the Diabetes Coalition hired Alexis Batausa. He teamed up with the Tug Valley Road Runners to organize a 5K “fun run” every month for local people, in addition to the big runs. It’s working! Check out this short video! See the monthly 5K schedule at http://mingodiabetes.com/monthly-races. The Diabetes Coalition and Road Runners also sponsor “Tuesday Night Track” each week and invite people to daily runs on the Road Runner facebook page. Batausa grew up in the area. He used to weigh more than 300 pounds. By 2012, he was down to around 170 pounds, running every day. “He’s a walking advertisement for what running can do,” said Vicki Lynn Hatfield, founder of the Diabetes Coalition. About 25 people participated in the first local 5K. “Don’t expect a big turnout at first. Just start doing it. People will see it and hear about it and join,” Batausa advises. Now, between 120 and 130 people run each month. In September 2014, they had 400! To encourage people to run inbetween races, Batausa leads daily runs. He keeps up the Tug Valley Road Runners facebook page with a steady stream of inspirational chatter, mentioning people who are running, telling where and when the next daily run will start. 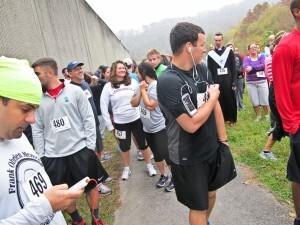 People line up beside the Williamson flood wall for the start of the October monthly run, some in costumes. They organized a 5K walk/run program in the public schools (a collaboration between the schools and Diabetes Association). “These kids are not going to grow up thinking running is weird,” Batausa said. 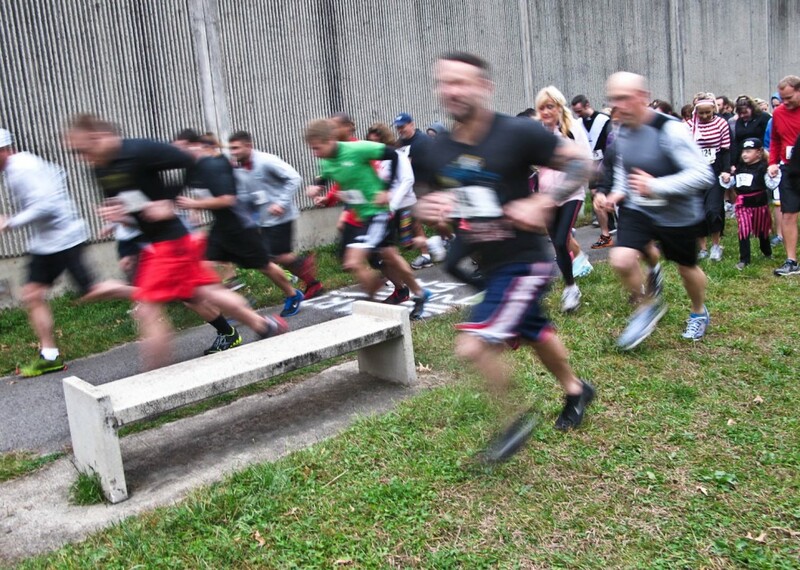 Now, when the the big Hatfield-McCoy 5K rolls around, a lot of local people run. “A lot of them came out for the monthly 5Ks and the Tuesday night training, so now they’re in shape to run the bigger races,” Batausa said. Want to get regular events going, to help people build an exercise habit? The monthly 5Ks follow a different route each month. This one took runners and walkers through West Williamson, over the bridge and up through the cemetery. The Tug Valley Road Runners have mapped a variety of interesting runs in Williamson. Make a list of people in your community who might want to promote more frequent exercise: healthcare practitioners, city officials, diabetes groups, employers, people who love a sport, people who travel out of town to participate in athletic events. People who already exercise regularly. Bring them all together to talk about it. Consider combining community runs with a run-for-fun 5K program in the schools. beginner classes for all ages. Check out the Critical Mass monthly bike rides in Huntington: http://www.huntingtonpulse.org/archives/211 and http://vimeo.com/40819340. What monthly events could you hold that wouldn’t cost a lot of money? List what you would need to hold them. How can you get funds to hold monthly races? Depends on what you include. If you buy T-shirts and little trophies, “they either break even or lose a little money.” Chronic disease costs business a lot of money. See the Try This “Fitness = Economic Development” page. Talk with local businesses about subsidizing monthly runs. Also see funding page. Alternative: Think of ways businesses could encourage their employees to join and offer them a company membership. Map many possible safe run/bike routes around your community. See the Try This trail mapping page. Talk with community government and police about ways they might help ensure the safety of runs or rides. Get them to OK routes for your events and agree to secure them during the run. If a route isn’t quite safe, what needs to happen to make it so? Start a facebook page to keep a daily conversation rolling. Copy the Mingo County people. Announce any daily runs. Is there anybody who will commit to leading daily runs, say, for the month? Research shows that social support is very powerful in helping people stay active. See these related Try This pages: all running and trail pages.